The Sunroc NSFD16WHDCP Water Cooler features water-cooled condensers and are designed for installations where water cooler operating efficiency must be maintained under extreme environmental conditions and for use where hazardous atmosphere are present. All controls and wiring are sealed in Underwriters Laboratories listed enclosure to prevent ignition of explosive atmospheres. Listed by Underwriters Laboratories under Electrical Equipment for Hazardous Locations in the following classes and groups: Flammable Gases or Vapors, Class I, Groups C and D, Div. 1; Combustible Dust, Class II, Groups E, F and G, Div. 2; and Ignitable Fibers and Flyings, Class III, which are described in detail in articles 500-4, 500-5, and 500-6 of the National electric code. 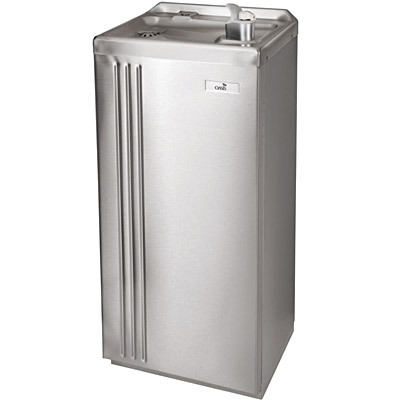 The P16FAWHDCP is corrosion resistant and has a stainless steel cabinet, frame, base parts and fasteners. Special protective coating is applied to compressor, condensor, cooling tank, pre-cooler, water drain and interconnecting water and refrigeration lines.